ProStrip Sandblasting and abrasive blasting were established in 2009 in the Taylors Lake Melbourne region in Victoria by qualified and professional sandblaster, Dominic Matiasik. Trusted within the auto-restoration, refurbishment and surface preparation industry Melbourne-wide, ProStrip is well acknowledged as a premium and high-performance industrial, commercial, domestic and mobile blasting offering a range of services. Sandblasting in Melbourne has been long known as one of the most effective ways to clean, repair and preserve any type of material – there is a blasting solution for every type of wood, glass or metal. ProStrip Sandblasting Melbourne is not only effective in surface preparation and defeating corrosion, toxic chemicals and wear and tear, but it is also economical. We offer a wide range of professional sand and abrasive blasting services for any material or surface texture that requires reconditioning; from your car chassis to marine, farming, mining and all heavy industrial equipment. We strip paint, grime, dirt and all unwanted substances according to each client’s personal requirement, using high-quality industry grit and abrasive media to ensure we meet the particular blasting demands, a successful blasting job at the highest standards and a fine surface finish. However, sandblasting is not only designed to get rid of rusty components, but it is also used for the preparation of surfaces for further treatment such as adding a coat of paint. ProStrip Sandblasting Melbourne homes a large space to cater for Commercial and Industrial Blasting where large machinery, oversized loads and high volumes of metal require a convenient, considerable-sized parking spot. Also colloquially known as ‘Tullamarine Airport’, we are located in Taylors Lake just 10-minutes away from Melbourne Airport. Since 2009, our Melbourne blasting services have been available to all local Melbourne regions suburbs for mobile and on-site blasting, including Carlton South, Carlton North, Docklands, East Melbourne, Flemington, Kensington, Melbourne CBD, St Kilda, North Melbourne, Parkville, Port Melbourne, Southbank, South Wharf, South Yarra, Thomastown, Craigieburn, Reservoir, Preston, Brunswick, Heidelberg, Epping, Richmond, Newport, Greensborough, Dandenong, Ringwood, Lilydale, Melton, Williamstown and West Melbourne’s Coode Island. Many refer to ‘sandblasting’ as a type of ‘abrasive blasting’. With that being true, there is a difference between the two as they each hold different types of blasting techniques and technologies. While both abrasive blasting and sandblasting are cleaning techniques used in surface preparation, abrasive blasting uses abrasive media such as glass beads, bicarbonate of soda or plastic media against surface materials, whereas sandblasting uses fine sand. Although abrasive blasting may require harder media for coarse surfaces, it will not be able to harm the material as long as the correct process and abrasive particle size is used on the particular material texture. For example, glass bead blasting is designed for use on stainless steel. Depending on the specific requirements, abrasive blasting can, therefore, be done from fine to coarse finishes. During the blasting process, the sand abrasive is directed with the use of a nozzle, which our professional and qualified sandblasters will use to aim at the targeted surface requiring cleaning. The end result provides a finer surface finish for any coatings to bond to. The life of the coating increases tremendously. However, each blasting technique used is unique to the blasting requirement. 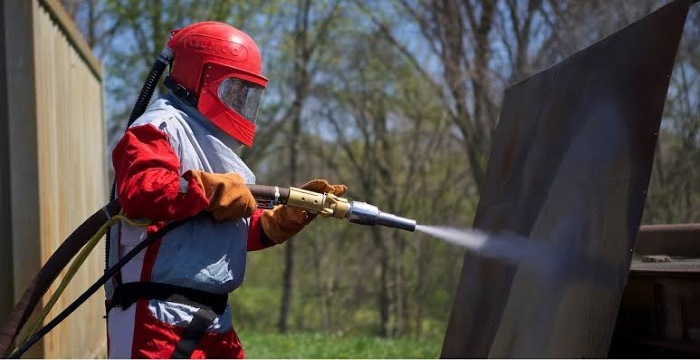 Due to Australia’s Occupational Health and Safety (OHS) Act and Regulations, we use specialised technologies and sandblasting techniques dependent on the type of equipment or surface requiring blasting, as well as the environment in which the blasting is taking place. ProStrip Sandblasting is an eco-friendly brand, which means we consider all impacts of blasting and abrasive media on the environment and ways in which we can avoid those impacts. Australia’s Office of Industrial Relations has set out an official “Abrasive blasting Code of Practice 2013”, which can be viewed here. Along with our high-quality standards, you can rest assure that ProStrip Sandblasting prides itself on having been built on these blasting Regulations and practices over the last 10-years. This is what makes our sandblasting services in Melbourne unique! There are different blasting techniques used to achieve different appearances depending on the material and the surface preparation goal thereof. During the sandblasting process, finely ground silica sand is used to abrade an unwanted surface material. There are different levels of blasting used to remove the top layer of the surface requiring blasting; from light blasting to medium or heaving blasting to remove more of the layer. This is done by means of compressed air-pressure or air-pressurized tank that fires out the sand with high impact, through a blast nozzle and large hose, at the appropriate surface. The end result is a fine surface which is ready for further treatment. Sandblasting is a technique designed to prepare rough or unwanted surfaces for further treatments such as painting, ceramic coating, galvanizing, rubber bonding, powder coating, electroplating and more. Car sandblasting is commonly used in cases where auto-restoration is required. We also refer to this as ‘automotive abrasive sandblasting’. Blasting your car, truck or vehicle components is a cost-efficient and effective way to strip your auto restoration project back to bare metal; ready for bodywork and paint. We specialise in providing car blasting and restoration services for classic cars, car engines, all vehicle parts, motorcycles and motorcycle engines and components, trailers and ute trays, and semi’s, flatbed, stock, and b-double trailers. Many of our clients turn to us for the textured and exposed aggregate appearance that concrete blasting provides. Our concrete blasting services provide the perfect concrete finishes, be it dirt, grime, uneven texture or graffiti. Our high industry standard blasting grit is made to tackle the rough surfaces of concrete patio walls, driveways, pavers, exposed aggregate and concrete stairs, schools, offices, parks, parking lots, shopping centres and many more. What makes our concrete sandblasting safe yet effective is that our high-quality sand grit high is able to travel at enough velocity to generate friction on the concrete surface being prepared without causing damage. The refurbishment of wood surfaces is another demand supplied by ProStrip’s sandblasters. Fine blasting grit is able to restore timber back to its original condition using a light sandblasting process. Our wood or timber blasting solutions offered include removing coatings such as paint, stains, lacquers and unwanted chemical substances. We offer wood restoration for ceilings, roofs, floors and any timber surface. Sandblasting is a common yet high effective surface preparation technique for steel material. ProStrip has previously provided a range of steel sandblasting services in Melbourne and is therefore leading experts within the industrial and commercial blasting industry. Using cutting-edge abrasive blasting grit, we offer the successful removal of rust and corrosion for further surface preparation of a protective coating. We specialise in stainless steel, structural steel and a range of steel parts and heavy machinery metal. In addition to the above materials and parts, ProStripSandblasting Melbourne has also worked with materials such as glass, fibreglass, aluminium, soft substrates such as hard plastic material and many more across a wide range of industries in Melbourne. Our clients for blasting in the Melbourne region range from domestic and residential to heavy industry and commercial machinery, as well as those requiring mobile and on-site blasting for large equipment and artworks that are not easy to move around. With our high quality, comprehensive blasting systems, we are able to sandblast anything that requires a fine finishing touch. We remove the hassle and send our professional, qualified and highly experienced sandblasters to your most convenient location in Melbourne. For more premium blasting services offered by ProStrip, get in touch with our professional sandblasting specialists in Melbourne. Advanced technology along with high-quality fine silica sand is generally used to ensure the successful restoration of material surfaces back to its original condition. Our sandblasting grit has previously successfully combated corrosion, toxic chemicals, wear and tear, and all unwanted contaminants such as tough textures and coatings. Some of our projects include the restoration of commercial properties, domestic homes, heavy industrial plants, equipment and machinery, and many more. Our qualified sandblasters in Melbourne ensure complete surface preparation and restoration by means of paint stripping, wood restoration, automotive restoration, marine restoration, brick and stone restoration, steel and pool blasting, rust removal, line mark removal and protective coating; among many other types of restoration – contact us more information on our surface preparation solutions. In addition to cars, ProStrip Sandblasting Melbourne also specialises in commercial and industrial blasting for trailers and trucks no matter the size or component of the part that requires reconditioning. We understand that time and convenience is a major factor for all business that needs to meet production demands. We, therefore, provide a service delivery option that removes the risk of delaying your daily operation by having to move your item to our blasting base in Taylors Lake, Melbourne. Instead, we will bring our blasting services to you! ProStrip professionals provide on-site and mobile blasting services and all you need to do is provide us with a time and location to which we can bring our on-site solution. With high-performance sandblasting equipment and technology at hand, we are able to effectively and efficiently clean, refurbish and prepare a range of industrial, commercial and residential projects back to its original condition, across the Melbourne region. ProStrip is the industry’s leading choice for on-site and mobile sandblasting in Melbourne. We know how important sand and abrasive blasting is! At ProStrip Sandblasting Melbourne, we do not just provide sandblasting services across the Melbourne region for the purpose of restoration. We pride ourselves providing clients premier blasting workmanship above industry standard by investing in only the best, high-performance blasting equipment and grit that the industry has to offer, as well as qualified in-house sandblasters with years of experience to perform effective, efficient, safe and environmentally friendly services. We specialise in commercial, industrial, domestic, residential, mobile and on-site sandblasting. We offer one of the widest ranges of sandblasting and abrasive blasting services in the Melbourne region. With over 10-years experience in blasting, our sandblasters are qualified experts in their field and can provide you with the best effective action plan for your surface preparation. Our blasting services are cost-efficient – get in touch with us for a free quote. We use high-quality blasting grit, powerful blasting equipment and environmentally friendly sandblasting techniques to ensure effective and long-lasting surface finishes. Our sandblasting Melbourne solutions are engineered to meet your specific blasting needs and requirements. We only use eco-friendly sandblasting grit that complies with the OHS.